The Hong Kong Trade Development Council (HKTDC) is a statutory body dedicated to promoting Hong Kong’s trade in goods and services. 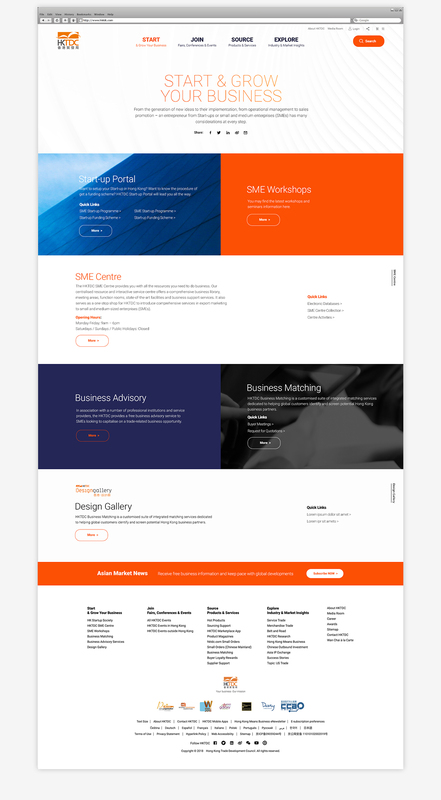 Their mission is to explore potential markets for Hong Kong companies, especially small-and medium-sized enterprises (SMEs), and connect them with business partners all around the world. With the help of their global network of 50 offices, including 13 on the Chinese mainland, they create opportunities and promote Hong Kong as a platform for doing business with the mainland and throughout Asia. 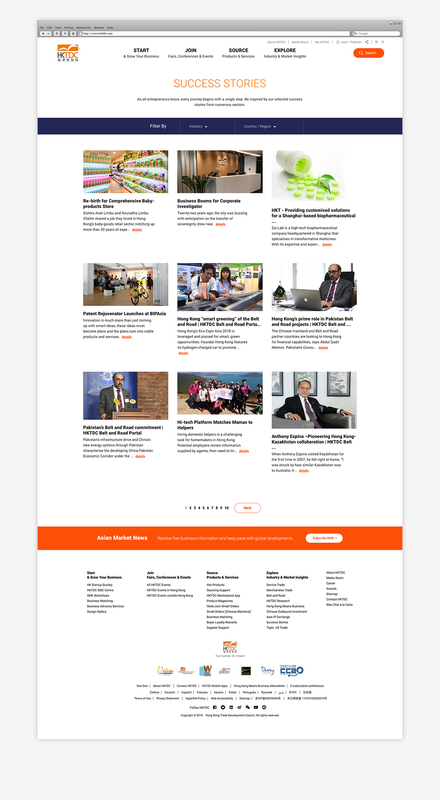 This website revamp project has its purpose in re-categorizing sub-portals and re-structuring the content listing in hktdc.com homepage, in which allows users to access HKTDC services in a more systematic, direct and handy way. With large volume of products, industries, and events information and different sub-portals, we analyzed much on the information architecture (IA) of the existing website. We conducted a website audit from internal stakeholders and collected convincing reasons through qualitative and quantitative researches and focus group co-worked with HKTDC. In fact, it is a challenge in balancing the beauty of trendy and informative website. 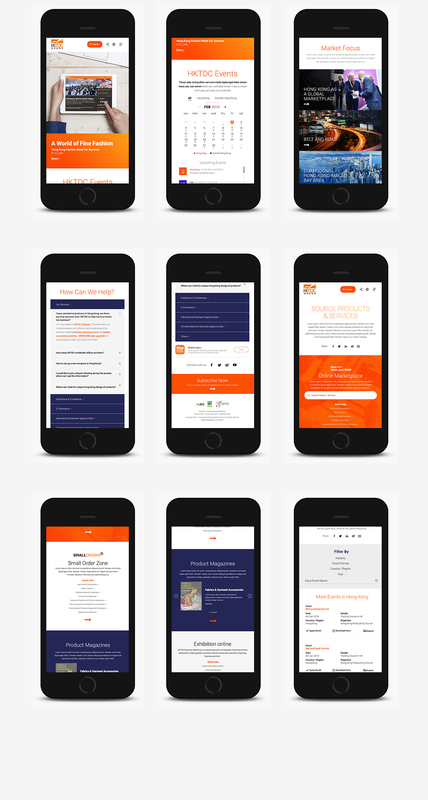 To build an atmosphere of harmony for an energetic design and influential content materials, our team created an iconic design with pervasive interactions and call to action functions to outstand the charismatic status of HKTDC. Besides, we proposed to apply a user-friendly navigation approach with 3 levels to simplify the navigation flow and enrich the usage of homepage; while we categorized different content information under 4 main sections to keep a neat layout display of one’s gaze and perception of a business opportunity provider and our team played around with different content display approaches to strengthen the cohesiveness and signify the importance of its different information provided. The combination of jumbotron image slide show and colour blocks help generating a sense of cheer when refreshing the website from time to time. 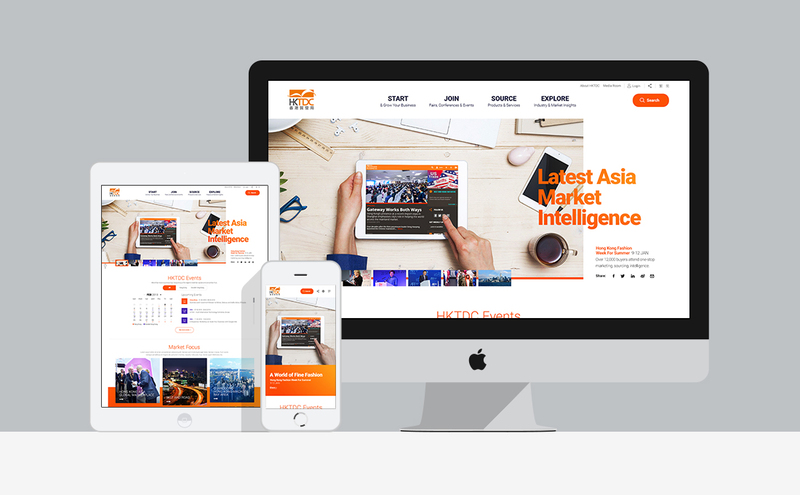 With the adoption of Responsive Web Design (RWD), the HKTDC website enhances the user-experience (UX), interactive experience and accessibility across different platforms and devices: mobiles, tablets, laptops, PCs. Throughout this project, HKTDC and our team worked very closely together on every aspect. 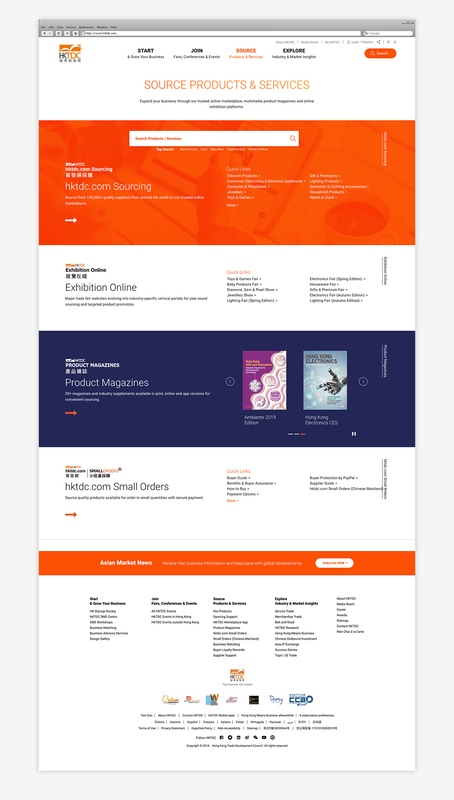 With her insightful guidance, we are glad that HKTDC appreciated our dramatic typography creation and has taken the design as a significant sample guideline of other HKTDC sub-portals.